Dedicated to music lovers in general and to those who love old Hindi and Malayalam film songs, old radios, gramophones, gramophone records etc, in particular. MUSIC DIRECTOR MADAN MOHAN, HIS MELODIES, HIS GHAZALS. When one thinks of old melodies, especially haunting melodies and ghazals of Hindi films one name that always come up top in the mind is that of the highly talented music director the late Madan Mohan (1924 – 1975).His career in Hindi film music, beginning with the 1950 film Ankhen , to the haunting melodies of film ‘Woh kaun thi’(1964), through his National Award winning music in film Dastak(1970), to the much acclaimed music of ‘Mausam (1974) and to the films released posthumously including the IIFF Award winning music of ‘Veer – Zaara’, had been a musical journey in the pursuit of excellence firmly rooted in Indian classical music where no compromises with quality were allowed. There were innumerable films for which he had composed music in which the Madan Mohan stamp was always there even in those films which did not do well in the box office. One notable feature of Madan Mohan’s music was his penchant for using ghazal style for his compositions especially during his earlier years. It was Madan Mohan who best exploited Talat Mahmood’s voice and talent for ghazals beginning with MADHOSH(1951-Meena Kumari-Manhar Desai)).In this film Talat rendered the beautiful lyric penned by Rajah Mehdi Ali khan,viz., ‘Meri yaad mein tumna aansoo bahana’ in his inimitable trembling voice. This song remains a much listened Talat ghazal even today. In film AASHIANA(1952-Raj Kapoor- Nargis), Madan Mohan composed two evergreen ghazals for Talat using the lyrics of Rajinder Kishen. One is, ‘Mera qarar leja’ and the other is, ‘ Mein paagal mera manva paagal’ often aired by Radio Ceylon and Vividh Bharati those days. In film CHHOTE BABU (1957-Nimmi-Sekhar), there is this popular ghazal by Talat, viz., ‘Do din ki mohabat mein humne’ and a Lata-Talat duet, ‘Teri chhamak ke aankhon mein’. In the highly popular film DEKH KABIRA ROYA(1967) with lesser known actors like Anita guha and Annop Kumar, Madan Mohan again uses the voice of Talat Mahmood to create another great ghazal, ‘Hum se aaya na gaya tum se bulaya’, the lyrics penned by Rajinder Kishen. In fact this film was a big musical hit with a wide variety of songs composed by Madan Mohan. There are two semiclassical numbers by Lata, the first being ‘Lagan tose lagi balma’ and the sweet melodious ‘Meri veena tum bin roye’. Along with these two there is also the soft, romantic melody, ‘Tu pyar kare ya thukraye’ indicating how best he uses Lata’s voice to embellish his rather difficult compositions. The film is also noted for one of the top semi-classical melodies of Manna Dey,viz., ‘Kaun aaya mere man ke dware’. 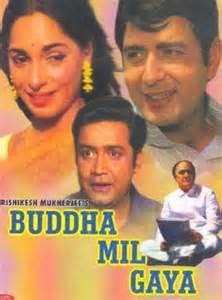 It is a pity that the music of this film did not fetch a Filmfare Award for Madan Mohan. The fruitful association of Madan Mohan with Talat continued in films like BAHANA(1960), with Meena Kumari in the lead. The lyrics penned by Rajinder Kishen, viz., ‘Barehen aasman meri manzil bata’ was tuned soulfully for Talat to croon and again an Asha – Talat ghazal was created with the lines beginning ‘Teri nighahen mein teri hi baton mein’. Lata’s melodious semi-classical number ‘Ja re badra bairi ja’ was also there. Sadly these songs are not often heard nowadays.The culmination of the success of the duo of Madan and Talat was in the film JAHAN ARA(1962-Bharat Bhusha-Mala Sinha)) . The three ghazals penned by Rajinder Kishen,’Phir wohi sham wohi gham’, ‘Main teri nazar ka suroor hoon’ and ‘Teri aankh ke ansoo’were probably the last of Talat’s fascinating ghazals for Hindi films as Talat Mahmood faded away thereafter to the regret of music lovers. A few of the best ever filmy ghazals of Rafi was also composed by Madan Mohan.The one coming to my mind readily is, ‘Main nighahe tere chehre se’ and ‘Yah hi hai tamanna’ from film AAP KI PARCHHAYIYAN (1964-Dharmendra-Sashikala) with lyrics by Rajah Mehdi Ali Khan who along with Rajinder Kishen was the most favoured lyrist of Madan Mohan. In film DULHAN EK RAAT KI(1967- Dharmendra-Nutan)we can listen to Rafi at his melodious best with the song ‘Ek haseen sham ko dil mera kho gaya’(Lyrics: Raja Mehdi Ali Khan).In film GATEWAY OF INDIA (1957-Bharat Bhushan-Pradeep Kumar-Madhubala)the duet ‘Do ghadi woh to pass ho baithe’ has two versions, one by Asha-Rafi and the other by Lata-Rafi, both versions equally captivating. In film AAKHRI DAU(1958-Sekhar-Nutan)there is this popular Rafi ghazal.’Tujhe kya sunaon mein dilruba’ and the melodious Rafi-Asha duet, ‘Humsafar saath apna chhod chale’. The songs of film WOH KAUN THI(1964-Sadhana-Manoj Kumar)’ was the crowning glory of Madan Mohan’s musical success. The film with supernatural incidents as its central theme, as in films like Madhumati and Bees Saal Baad, had some of the top haunting melodies common for such themes those days. The song “ Aajare pardesi(Madhumati-Lata- Music: Salil Chaudhury) and ‘Kahin deep jale kahi dil( Bees Saal Baad-Lata-Hemant Kumar)were till then two of the top such songs. But Madan Mohan, with three songs by Lata, viz., ‘Naina bharase rim jim rim jim’, ‘Jo hamne dastan apnee sunaaee aap kyon roye’ and ‘Lag jaa gale se phir ye haseen raat ho na ho’ rewrote history. The beautiful lyrics of these songs were by Raja Mehdi Ali Khan and no wonder why he became one of Madan Mohan’s preferred lyricists. That reminds me about a rare duet of Madan in this film, viz.,the breezy “Chhod kar tere pyar ka daman’ (Lata-Mahendra Kapoor)The music of this film was nominated for Filmfare Award for best music but to Madan Mohan’s eternal disappointment the Award was given to Laxmikant Pyarelel for film DOSTI. Even prior to Woh Kaun Thi, Madan Mohan in film ANPADH(1962-Dharmendra-Mala Sinha) had composed a few beautiful melodies including the path breaking ‘Aap ki nazaron ne samjha’ of Lata. There is also a rare comic song in the film , Mahendra Kapoor’s ‘Sikandar ne porus se’. 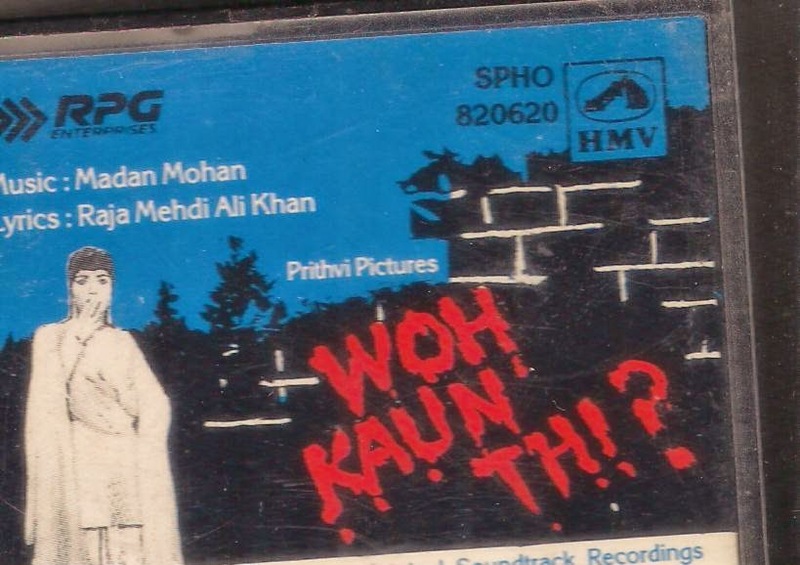 The success of Woh kaun thi led director Raj Khosla to make two more films with similar theme viz. Mera Saaya and Anita. For Mera Saaya Madan Mohan composed yet another haunting memody for Lata,viz., ‘Too jahan jahan chalega mera saaya sath hoga’ which was a superhit. But for film ANITA Laxmikant Pyarelel was assigned to do the job. Obviously, by then this musical duo had arrived on top. 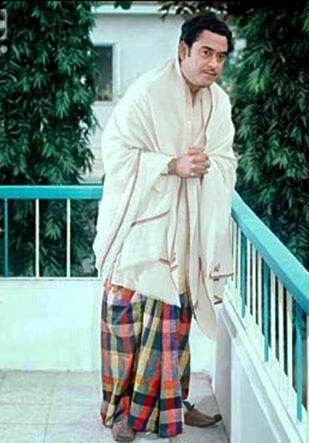 The decline of Madan Mohan also started around this period. Madan Mohan continued to compose music for several films but the magic, somehow, remained unnoticed. The films were not box office successes and top artists were also not there in them. He tried to make a come back with HEER RANJHA (1970) and DASTAK(1971-Sanjeev Kumar-Rehna Sultan) but it was not enough. The highly acclaimed Dastak fetched the National Award for Madan Mohan with Lata’s ‘Baiyaan na bharo balma’ becoming highly popular. Again his music in film MAUSAM( 1974-Sanjeev Kumar Sharmila Tagore) showed that he had not lost his magic as the Lata-Bhupinder duet ‘Dil dhoondtha hai’ and Lata’s solo ‘Ruke ruke se qadam’ achieving tremendous popularity.But alas! In spite of his enormous talent and success he could not get the same prominence which Naushad, S.D.Burman, Shankar Jaikishen and even a Laxmikant Pyarelal could get. He was more like the ‘Kabhi Kabhie’ Khayyam and the ‘Hum Dono Jaidev who also could not achieve the celebrity status in spite of talent and success. Talat Mahmood, Madan Mohan’s most trusted male voice, said of Madan Mohan; ‘ Madan Mohan never made any compromises in his life and in every tune he produced there was newness”. Probably his inability to make compromises stood in the way. M U S I C D I R E C T O R R A V I - HIS CHAUDHVIN KA CHAND. The years 1960 and 1961 were years of great melody in Hindi films with the release of highy successful, musically charged films like Mughal-E- Azam, Barsaat ki Raat, Kohinoor , Chaudvin ka Chaand, Junglee, Gharana, Sasural,Hum Dono, Kala Bazar and so on. The decades of the 50s and the 60s were also the heydays of great music directors like S.D.Burman, Shankar Jaikishen, Naushad, O.P.Nayyar, Roshan and so on whose songs were hitting the top of the chart on the radio and figuring prominently in the list of winners of the Filmfare Awards . In the early 60s two songs from two films used to be heard several times daily on the radio be it the Radio Ceylon or Vividh Bharati of AIR. Both the songs are by Muhammed Rafi, the title song ‘Chaudvin ka chaand ho’ from that film and ,‘ Husnewale tera jawab nahin’ from film Gharana. They were two of the top songs of the period and both were composed by the redoubtable, but less celebrated, music director Ravi ( Ravi Shankar Sharma-March 1926 – March 2012).There are several common factors for the two songs; both were penned by Shakeel Badayuni winning Filmfare awards for best lyricist for the songs in 1960 and 1961; the song Chaudvin ka chaand won for Rafi the Filmfare Award for the best male singer and the song Husnewale tera jawaabb nahin won for Ravi the Filmfare Award for the best music director ; both are beautiful romantic melodies delightfully picturised on the pairs of Guru Dutt-Waheeda Rahman and Rajinder Kumar - Asha Parekh respectively ; the first is intense and the other happy and light hearted. Frequently heard on the radio and repeatedly featuring in the weekly Binaca Geetmala programs the two songs were our favourites eventhough the top of the hit position in the Binaca Geetmala program for the years 1960 and 1961 were won by Roshan’s ‘Zindagi bhar nahin ‘ (Barsaat ki Raat) and S & J’s ‘Teri pyari pyari’ (Sasural) respectively. Ravi’s earlier films like Vachan, Ek Saal, Dilli ka thug, Chirag Kahan Roshni kahan and so on also had several beautiful songs in them. 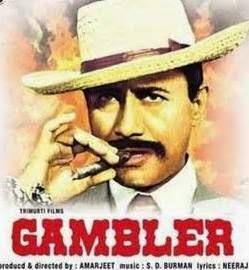 Film Dilli ka thug had a few popular songs by Kishore Kumar and Asha Bhosle like ‘ Yeh ratein yeh mausam nadi ka kinare’ (Kishore -Asha), Yeh bahar yeh shama(Asha) and the hilarious, ‘C.A.T., CAT Cat mane billie’ (Kishore). In Chirag Kahan Roshni Kahan there is this children’s song ‘Tim tim karke tare...’. In Ek Saal there is this immortal ghazal of Talat Mahmood, ‘ Sub kuch luta ke hosh mein aaye to kya hua’. But it was Ckaudvin ka Chaand which gave Ravi the well deserved recognition as a top music director of Hindi films. 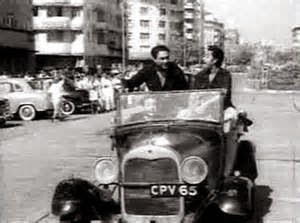 The song scene of the title song Chaudvin ka chaand showed how best even black and white photography (Cinematography- V.K.Murthy) can exploit the light and shade to glorify a scene.The film has a few other wonderful songs like Rafi’s ‘Yeh Lucknow ki sar zameen’ and the Asha Bhosle – Shamshad Begum qawwali, ‘Sharma ke kyun pardanashin’ (two parts). The song ‘Husnewale tera jawwaab nahin’ from film Gharana still remains as one of the top romantic songs of Rafi.There was no looking back thereafter for Ravi in the 60s and early 70s when he came out with musical hits for films after films like Khandan, Bharosa, Kajal, Gahra Daag, Pyar ka Saagar, China town,Do Badan, Ankhen, Waqt, Neeel Kamal, Tower House, Yeh raaste hai pyar ki, Aaj aur Kal and many more. The music of film Khandan (Sunil Dutt- Nutan)brought for Ravi the Filmfare award for best music director in 1965; the song ‘Tuhmi meri mandir’, one of the noted bhajans of Lata, brought her the Filmfare award for best female playback singer and the best lyricist award for Rajinder Kishen. The Guru Dutt – Asha Parekh starrer Bharosa had a beautiful song by Rafi, ‘Is bhare duniya mein’ and a duet, ‘Aap ki mulakat bas itni’ by Lata and the then new singer Mahendra Kapoor.For Ravi, Asha remained his favourite female voice with songs like the bhajan, ‘Tora man darpan’ and the semiclassical number, ‘Chhun chhun gungharu bole’ both from film Kaajal( Dharmendra-Hema Malini),the ‘Jab chali tandi hawa’number from film Do Baaden (Asha Parekh- Manoj Kumar), the songs ‘ Chehre pe khushi chha jaati hai’ and ‘the haunting ‘Aage bhi jane na tu’ from the star studded film Waqt (Raj Kumar, Sadhana,Sashi Kapur, Sharmila Tagore, SunilDutt, Rahman and Balraj Sahni) and many more from other films.But it is also a fact that some of the best songs of Ravi in female voice were also by Lata like, e.g., the melodious ‘Lo aagayi unki yaad’ from Do Baadan,’Lagi na mora jiya’ from film Gunghat,’ Ai mere dil-e-naadan’ from Tower House, ‘Milti hai zindagi’ from Ankhen and so on. In Yeh raaste hai payarki’, a film based on a real life story and in which Ashoj Kumar gave a memorable performance as the defence lawyer, there is the title song, ‘yeh raaste hai pyar ki’ by Asha and a duet of Asha with Rafi,’ Yeh kahmoshiyan yeh Tanhaniyan’ boh very popular and frequently heard on the radio those days but sadly missing nowadays. This applies to the rare songs of Mukesh for Ravi in film Pyar ka Saagar, e.g. ‘the duets with Asha,‘Vafaa jin se ke bewafa ho gaye’and the grief filled ‘Pyar ka saagar dekha hai’. That reminds me of the songs of Mukesh for Raj kapur in film Nazrana, especially the beautiful inter active duet with Lata,‘Bikhrake zulfein chaman mein' and the sad Mukesh solo,‘Ek woh bhi Diwali thi. Film Gumrah( Sunil Dutt-Mala Sinha) marks the beginning of a long and fruitful association of Ravi with singer Mahendra Kapoor . In fact it was Ravi who lifted the singer, reeling under the shadow of a Rafi at his peak, to the centre stage with this film. In fact there was no song for Rafi in this film and the three solos rendered by Mahendra Kap oor, viz., ‘Aap aayen’, ‘Aa bhi ja’ and Chalo ek bar’ earned for him an identity of his own and listeners could connect to his voice and style separate from that of Rafi. The songs were super hits on the radio and Mahendra kapoor won the Filmfare Award for the best male playback singer for the song ‘Chalo ek baar’. The duet, ‘aaja aaja re’ with Asha also was hugely popular. Film Gumraah was followed by Waqt in which Mahendra Kapoor had three duets with Asha the top being ,’Maine ek khwab sa dekha hai’ and, ’Din hain bahar ke ‘ a close second. Of course the most popular song of the film is by Rafi,viz., ‘Waqt se din aur raat’ followed closely by the evergreen Manna Dey hit, ‘Ae mere Zohra Jabeen’. The success of the team of Ravi-Sahir Ludianvi(lyrics) and Mahendra Kapoor in film Gumraah and Waqt was repeated in the super hit film Hamraaz(Sunil Dutt-Vimi- Raaj Kumar). In fact it was Mahendra Kapoor all the way in this film with four super hit solos including , ‘ Yeh neele gagan ke tale’ which won him the Filmfare Award for the best male playback singer for 1967. The song ‘Na moonh chupake jiyo’ and ‘Tum agar saath dene ka wada karo’ were also super hits along with the high pitched, melodious ‘Kisi pather ke murat se’. These songs were a fitting reply to the critics, many of them perhaps motivated, who sidelined Mahendra Kapoor as a singer who adopted Rafi’s style. The singer’s own style was, of course, obvious to the discerning listeners. There are two films the music of which showed Ravi’s talent and range in different types of music. One is film China Town, (1962-Shammi Kapoor-Shakila) in which all the songs were by Rafi and Asha. The film offered ample scope for dance songs, Rock-n-roll and club dance songs etc. and Ravi showed that he could do justice to the need. Though the film was not a huge hit the songs were very popular , the ‘Bar bar dekho ‘ in particular, with Rafi sizzling. The songs ‘Yumma yumma yumma’ and the title song ‘China town’ shows Asha in her elements . The duets of Rafi and Asha, ‘Bada quatil hai’ and ‘Humse na poochho’, were also pleasing. Ravi with these vibrant foot tapping songs showed that he can give even O.P. Nayyar a run for his money as far rhythm is concerned. The other film which tested Ravi’s talent is the 1982 film Nikaah with Raj Babbar, Deepak Parashar and Salma Agha in the lead. All the songs of the film were Ghazal based ones as demanded by the theme and all of them were rendered by Mahendra kapoor and the leading lady Salma Agha herself.The ghazals were appreciated by the discerning listeners and it was Salma Agha who got the Filmfare award for the best playback singer of the year for her song ‘Dil ke armaan ansuon mein bah gaye’, the special nasal timbre of her voice helping her to do justice to the composition. This is true in the case of ‘Fiza bhi hai jawab bhi (in two parts) also. Mahendra kapoor shows his range in the ghazal, ‘Bete hue lamhon ki kasak saath to hogi’ and also in the duet with Salma, ‘Dil ki yeh arzoo thi’ with clear, emphatic delivery of words. The qawwali,’ Chehra chhupa liya hai kisi ne nagar mein’ by Kapoor, Asha and Salma is an added attraction. The LP album of the film also contains Ghulam Ali’s famous composition ‘Chupke chupke raat din’ making it a collectors’ item. Music director Ravi who was very busy in Hindi film music till the early years of the 70s was seen less and less thereafter and during the 80s and 90s became very busy in Malayalam films especially in association with director Hariharan and poet/lyricist O.N.V. Kurup and came out with award winning music in films like Panchagni, Nakhashatangal, Sargam ,Vaisali, Parinayam, Srukretam, Ghazal and so on. He won National award for best music Director for films Parinayam and Sukrutam and Kerala State Award for Nakhakshatangal and Sargam. Singer K.S.Chitra won her third National Award for the song ‘Indupushpam choodi’ from film Vaisali. Though Ravi came back into Hindi film music strongly with Nikaah in 1982, he was unable to weave his former magic as by then the trend had changed with the ascendancy of Kishore Kumar, Lakshmikant Pyarelal and so on and had to remain content with working in Malayalam films with Mayookham(2005) being his last Malayalam film. Music Director Ravi, Known as Bombay Ravi in Malayalam film world continues to be remembered and respected in Kerala as a king of melodies. M E M O R I E S A B O U T A M O T O R C A R.
Meeting an old friend and colleague a couple of days back rekindled in me fond nostalgic memories about a ‘minor’ motor car owned by him for about 45 years from the late 60s; a Morris Minor 1951 four seater four door sedan made in England. 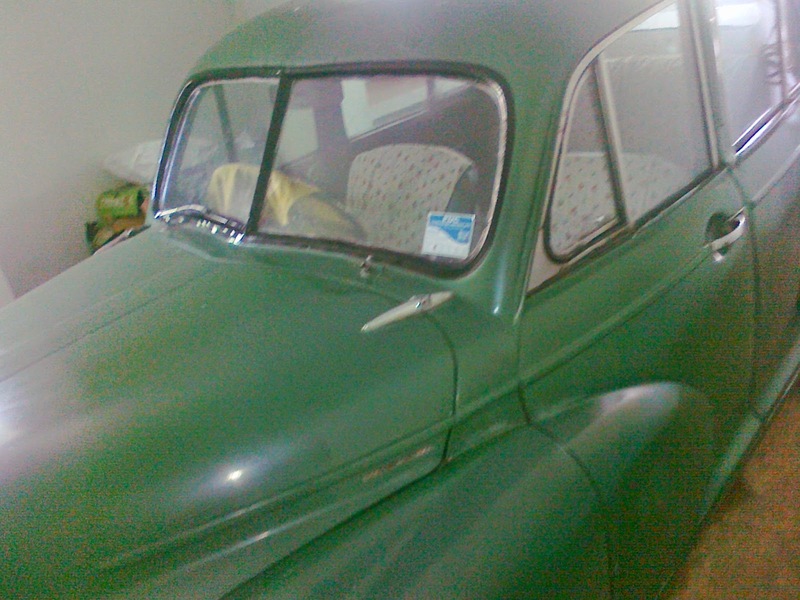 The car is KLE 7488 in its original greenish shade common for Morris Minor cars of the period. The car with a side valve engine had its head lights mounted on the wings instead of down in the grill console as in the earlier models. Morris Minor cars were common on Kerala roads in the 50s and the 60s especially in bigger towns like Kozhikode, Cochin, Trivandrum and so on.This rather slow moving car, compared to the present day cars , was but very convenient to drive in the crowded city roads as well as through narrow by lanes of residential areas owing to its compact size and easy manoeuvrability. I have been seeing this car of my friend ever since he bought it. In the early 70s he was transferred to Bangaluru and posted in the same office in which I was working and took up a house on rent next to the house where I was staying with my family. I still remember his arrival in Bangalore in the Morris Minor driven all the way from a northern centre of Kerala. He stayed in this house for a few months with his family before shifting to a house near to the office. 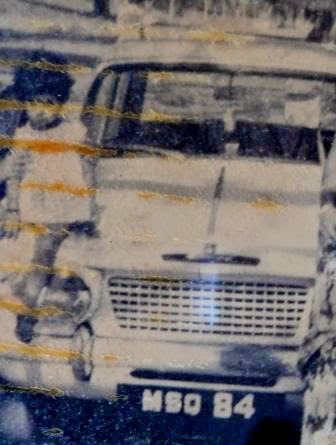 During this period in particular and thereafter till I was transferred out of Bangaluru in 1975, the two families had travelled in this car extensively to every nook and corner of Bangaluru be it the Cubbon Park , the Lal Bagh, Vidhan soudha, residential colonies like JayaNgar , Rajai Nagar, Wilson Gardens , restaurants like the MTR, Brindavan, Nilgiris etc and so on. My friend, like me, was fond of films and it was mostly in his car that the two families went for films except on those occasions when my 1967 Standard Herald was taken out. Our rides through the long roads of Indira Nagar, Double Road, M.G.Road, walks on the Brigade Road and Commercial Street after parking the car are all still fresh in memory. The car was well maintained with every problem attended to promptly. Even in the 70s spare parts were not easily available. Once we had to go around the whole of Bangalore to get a set of special screw type wheel bolts. I also remember a complete overhaul including a fresh coat of paint done to the car at Bangalore. My friend who wore only white clothes had always kept the car clean and tidy with the seats covered with white Turkish cloth! He drove the car with effortless ease and we used to marvel at his ability to reverse the car through narrow curving roads! During the 80s also when we were working at Thiruvananthapuram and Ernakulam I had travelled in the car frequently. 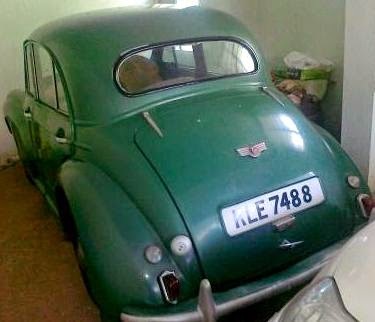 While I had changed my car several times by buying ‘new’ second hand ones, my friend continued to keep the Morris Minor and after his retirement towards the end of the 80s he settled down in Trivandrum. We continued our contact and the car used to come up in our conversations often. A few years after my retirement in the year 2000 I had visited him at Thiruvananthapuram and he dropped me back at the Rly.station in his Morris Minor . Years passed by and when I went to his house again two years back the car was very much there and I had taken a couple of casual photos on my mobile. When I met him at Kozhikode on the 5th of this month, I enquired about the car assuming that it was still with him. To my utter surprise and disbelief he told me that he had sold it off a few months back. A sudden thought that I could have purchased it instead of it falling into some other hands entered my mind. But it vanished faster than it came when it was revealed that it was sold for a fancy price to a vintage car collector who had been pestering my friend to sell it to him for several years. The reasons for selling off the car which was close to his heart for so long , after refusing to do so for years, were strong enough. The ophthalmologist had declined to give a certificate for renewing the driving licence; getting the driving licence of an 85 year old renewed is next to impossible; the re-registration and insurance were falling due; practical difficulties for future maintenance are many; above all his son’s advice to sell it off for a good price coupled with the thought that it was going into safe hands clinched it. Yes, a vintage car collector’s garage is the best destination an old car can hope for. Old cars seem to be better placed than old people for whom the mythical heaven is the only, though futile, destination to hope for. Tail piece:-How I wish I had retained my first car, the Standard Herald 1967 Model two door Sedan MSQ 84 which I sold off in 1978!! K I S H O R E K U M A R - SINGER PERFORMER WITHOUT PAR. It has always been fascinating for lovers of old Hindi films and songs to marvel at the genius of Kishore Kumar, the producer, director,writer, music director, actor and, above all, singer, who ruled the Indian film scene on his terms during about four decades from the 1950s.Even now the young and the old adore him for the wonderful songs he had composed for himself as well as for other singers and for the innumerable songs of different genre he rendered for all the other acclaimed music directors of the period. For me, what makes Kishore Kumar’s contribution to film music different is the fact that almost all his songs upto the middle of the 70s, were popular and there would never be a dull moment when we listen to these songs be it a melody, a semi classical, a grief filled, a hilarious or even an ‘non sensical’one. His unique voice, open throated style of singing, adaptability to the mood and situation of the song, his very successful stage shows which probably started the trend of audience participation all made him a darling of the masses. This made me remember many of the hit songs of this trio of Kishore, Dev Aanand and S.D.Burman especially of the 1950s during the first phase of Kishore’s singing career. As mentioned in my earlier posts there were a few such successful trios like Rafi, S&J and Shammi kapur, Rafi, Naushad and Dilip Kumar, KIshore, RDB and Rajesh Khanna in the late 70s and so on. The beauty of the songs of these trios is that one can think of them only together as the thought of one necessarily brings the other two to mind. One such song of the trio of Kishore, SDB and Dev Annand is this soft ’Mana janaab ne pukara nahi’ from film PAYING GUEST with Nutan in the lead. Another is the one ‘Hum hai raahi pyar ki’ from film NAU DO GYARAH(1957), a Dev Anand-Kalpana Karthik film. A rare duet of Kishore with Asha, viz.,’Aankhon mein kya ji’ is also there in the film. In film MUNIMJI(1955), a Dev Aanand Nalini Jaiwant film, the soft, flowing ‘Jeevan ki safar mein rahi’ was very popular. Film FANTOOSH (1956- Shiela Ramani) is remembered for Kishore’s sombre ‘Dukhi man mera’. While Dev Aanand continued his success pairing with several of the leading female artists of Hindi film world, for S.D. Burman, Kishore remained a favourite voice for Dev Aanand even in the 60s , but in a limited way, with songs like ‘Yeh dil na hota bechaara’and the duet with Lata,viz., ‘Aasman ke neeche’ from film JEWEL THIEF (1967) wth Vyjayanthimala in the lead. In TEEN DEVIAN(1965), with Simi Garewal, Nanda and Kalpana in the female lead, there is this haunting melody of Kishore, in two versions, viz. ‘Khawab ho tum ya koi haqueeqat’ reminding us of SDB’s own superhit ‘Pyar dewaana hota hai mastana hota hai’ by Kishore from the epoch-making musical film AARADHANA. In the superhit film GUIDE(1965) the music of which had earned huge popularity for SDB, there was only one song , that too a duet with Lata, for Kishore, viz., Gaata rahe mera dil’ which is a departure from the past. In fact Rafi was given the pride of place with two haunting melodies,’Kya se kya ho gaye’ and ‘Tere mere sapne’. Again there was no song for Kishore in film MANZIL(1960), a Dev Aanand Nutan starrer in which SDB preferred Manna Dey, Hemant Kumar and Rafi instead of Dev Aanand’s usual voice Kishore. It happened in Dev Aanand’s other musical hits like BOMBAI KA BABU(1960-Suchitra Sen) , KALA BAZAR(1960 Waheeda Rahman) and KALA PANI(1959- Madhubala). In all of them it was Muhammed Rafi all the way. The fact that this had happened in films of Dev Aanand’s own production house, Navketan, speaks for itself. Yes, by 1960 and for the next decade Rafi had emerged as the top male voice in Hindi films. But, still, SDB used the voice of Kishore in yet another Dev Aanand film PREM PUJARI(1970-Sharmila Tagore) for this soft melodious song,’Phoolon ke rang se dil ki kalam se’ to the utter delight of Dev-SDB-Kishore fans. With the rise of Rajesh Khanna as the first super star of Hindi cinema with the release of the two hugely successful romantic musical hits AARADHANA(1969- S.D.B) and KATI PATANG(1970- R.D.B) Kishore Kumar re-emerged as the No.1 play back singer and continued to be so till the end in 1987.The song ‘Roop tera mastana’ rendered in his inimitable style which won him the Filmfare Award for the best singer and the romantic song ‘Mere sapnon ki rani’ from Aaradhana were the rage of the period especially on the campuses. 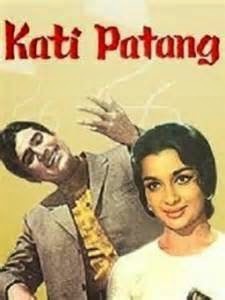 The captivating songs like ‘Yeh shaam mastani’ and ‘Yeh jo mohabat hai, composed by R.D.Burman for film Kati Patang marked the beginning of the trio of Rajesh Khanna-Kishore - RDB with a large number of hit songs to follow. In fact Rajesh Khanna’s rise to super stardom owes a lot to the music of SDB, RDB and Kishore whose voice suited best for him, the romantic hero he was! Besides, it was under SDB and RDB that Kishore gave most of his memorable songs.Two songs readily coming to mind are the super sweet, ‘Deewana leke aaya hai dil ka tarana’ and ‘Oh mere dil ki chain’ from film MERE JEEVAN SAATHI (1972- Rajesh Khanna –Tanuja). In film AMAR PREM(1972-Sharmila Tagore) there are three songs of Kishore, viz., ‘Kuch toh log kahenge’, ‘Chingari koi badke’ and the soft persuasive ‘Yeh kya hua kaise hua’. In Rajesh Khanna’s super hit film NAMAK HARAM(1973-Rekha- Amitab Bachhan) again there are three songs of Kishore of which the one ‘Diya Jalte hain’was the most popular. The outstanding performance of Amitab Bachhan in film Namak Haram propelled him into stardom and two very successful films followed with S.D.Burman’s music and Kishore rendering some of his top romantic songs for Amitab Bachan. The first is film ABHIMAN(1973-Jaya Bahduri)with the song, ‘Meet na mila re man ka’ and the duet with Lata, ‘Tere mere Milan ki yeh raina’. The other film is MILI(1975-Jaya Bahduri) with two songs by Kishore,viz., ‘Badi sooni sooni hai’ and the soulful ‘Aaye tum yaad mujhe’. Two other notable RDB-Amitab-Kishore films are Hare Rama Hare Krishna(1971-Zeenat Aman)and Manzil(1971-Mousumi Chatterjee). The ‘rain’ song ‘Rim jim gire saaawan’ from film Manzil is remembered even today for the beauty of the composition and the picturisation of the scene. Two out of the eight Filmfare Awards for best singer were won by Kishore for his songs for Amitab, viz., for film DON (Music by Kalyanji Aanandji) ‘Khaike pan Banarasiwala’, and for NAMAK HALAL(Music Bappi Lahri-1982-Smita patil)the beautiful and one of the rare semi classical numbers of Kishore, ‘Pag ghunguroo bandh Meera naachi thi’.That reminds me of RDB’s song for film SAAGAR(1986-Rishi Kapoor-Dimple),viz., ‘Saagar kinare’ which gave Kishoren another Filmfare Award for the best singer. Music directors Laxmikant Pyarelal had composed some of the evergreen melodies for Kishore Kumar.In Mr.X IN BOMBAY the song. ‘Mere mehboob khayamat hogi’;for film DAAG the song , ‘Mere dil mein aaj kya hai’; in filmDO RAASTE the song ‘Mere nazeeb mere dost’ and for film HUM SUB USTAD HAI the song ‘Ajnabi tum jane pehchane se’ come readily to mind. 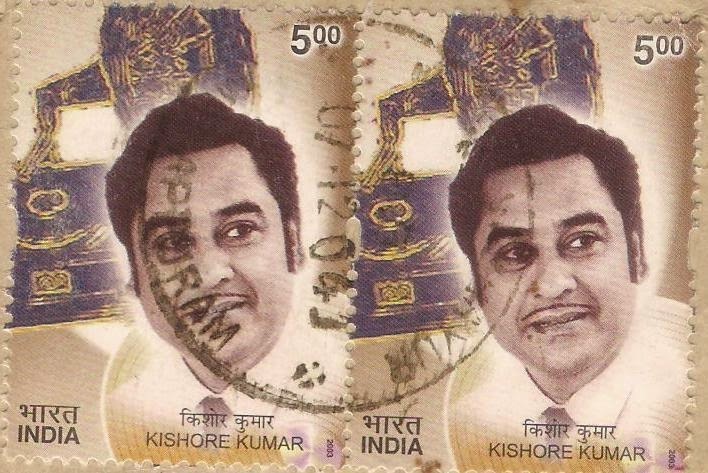 I also remember a few popular songs of Shankar Jaikishen for Kishore Kumar. One is ‘Nakhre wale’ from film NEW DELHI; another is ‘Hum matwale naujaawan’ from film SHARARAT;two from film RANGOLI,’Rangoli sajaore’ and ‘Chhoti se yeh duniya’. Kishore’s ability to ‘yodel’ has been used with great effect by S&J for some of these songs. Kishore’s song ‘Zindagi ek safar ek suhana’ of film ANDAZ(1971) was the top of the chart song of the popular Binaca Geetmala program of Radio Ceylon in 1971. Composer Ravindra Jain’s ‘Ghungaroo ki tarah’ (Film Chor Machaaye Shor-1974),Hermant Kumar’s ‘Woh Shaam kuch ajeeb thi’(Film-Khamoshi),and lyricist turned music director Prem Dhavan’s, ‘Teri duniya se hoke majboor chala’(Film Pavitra Papi)are some of the other songs which passed through my mind.The last named used to be heard repeatedly over the radio during early 70s but, regrettably it appears, the song has gone into oblivion. Kishore Kumar, the genius, always wore a mask of eccentricity probably to guard his privacy and led a life away from the limelight towards the end of his career. His tiff with the Income Tax authorities were well known reflected in this hilarious song ‘Guni jano bhakth jano’with words coined by the names of film stars and films and the song ending with words ‘Peeche pad gaya income taxum’! ( Film Ansu aur Muskan-Kalyanji Aanandji). 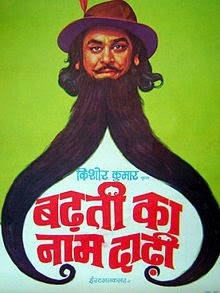 Many still remember the out and out comedy film CHALTI KA NAAM GADI. Who else but Kishore could direct a full length parody film BADDTHI KA NAAM DADHI? Tail piece:-Unbelievable that Kishore did not sing a song for composer Naushad! GRUNDIG REEL TO REEL TAPE RECORDER. TK141. HINDI FILMS :THOSE WONDERFUL TITLE SONGS. GRAMOPHONE RECORDS - MALAYALAM L..Ps. OLD IS STILL GOLDEN - BATTING FOR AUDIO CASSETTES. THOSE WONDERFUL NOSTALGIC MUSIC DEVICES. HINDI FILM SONGS :NOSTALGIC GOLDEN OLDIES. SHAMSHAD BEGUM- THE LEGENDARY INDIAN SINGER. JAGJIT SINGH - THE UNFORGETTABLE. I am a Disco Dancer - The singer Vijay and the song.